When you make it to the river (which actually happens a lot less often than you might think), all the players have been given the final card on the board with which to make their best 5-card hand. River strategy is different to strategy on other betting rounds because with every other street there are always more cards to come to help players improve their hands, but on the river you are stuck with what you are given. The river betting round is free from all the complications of pot odds, implied odds and all other types of mathematics that are involved with drawing hands. However, this does not necessarily mean that the river is an easier round to play. River strategy can become very tricky as players will either ‘have it’ or they won't, and so the players who don't make the hands that they were hoping for will sometimes make one last effort to try and take down the pot with a big bluff. Therefore to play the river well, you should always think about all of the information you have gathered from each street in the hand you played against your opponent up until this point to help influence your decisions. How to play the river. As I just mentioned, you have to think about the way your opponent has played the hand on each street to help inform your decision on how to play on the river. The more information you have, the more pieces to the puzzle you can fit together to build a bigger picture of what your opponent may be holding. By the river it is often likely that your opponent will have given off enough information through the way they have played to indicate what kind of hand they are holding, so it is just a case of thinking through the hand and looking for it. Always take your time to evaluate all of the plays that have taken place up to that point on the river. You can find a lot of useful information if you think about the hand carefully. If your opponent has been playing as if they had a drawing hand on each street, and then comes out with a bet when the river comes with a card that could not have helped them, you can be fairly sure that they are bluffing be happy to call their bet if you have a decent hand. Similarly, if an opponent has been playing very aggressively on previous streets by betting and raising but plays very weakly on the river by checking, you can happily sense they are trying to trap you and trying to induce a bluff. You are confident you have the best hand. You are confident you have the worst hand. You are unsure about whether you have the best hand. The first two situations are easier to play in, both in and out of position, but things can become very tricky when you are not sure about whether or not you have the best hand. So here is a quick guide on how to play in or out of position when in each of the situations mentioned above. Playing the river in position. - You are confident you have the best hand. If you are confident you have the best hand, you want to get as much money from your opponent as possible. This means that you should definitely bet and raise to get more and more money into the pot. It is better to make big pot-sized bets on the river rather than smaller bets to try and entice your opponent into calling. It will be more profitable to make big bets even if your opponent calls less often, as it is explained in the article on maximizing value. - You are confident you have the worst hand. When you feel that you have the worst hand, you should be happy to fold the majority of bets your opponent makes on the river. It is unlikely that opponents will bet into you out of position with a poor hand, so always lean toward folding rather than raising in an attempt to bluff. If your opponent checks to you, you are now faced with the tough decision of whether or not to bluff. It is in these instances that you should use all the information from the way your opponent has played up until this point to decide whether a bluff is likely to work. Always try and be at least 80% sure that a bluff will be successful before making one, and fold if you have any doubts in your mind at all. - You are unsure about whether you have the best hand. If our opponent checks to us, then we should almost always check behind them and turn the cards over to see who has won. This is because if you ever bet in this position, it is unlikely that you will get a call from a player that we have beat, but it is likely that we are going to get a call from a player that has us beat. So just check it down and hope that your hand is the winning one after they have been turned over. Don't bet marginal hands on the river. You are only going to get called by better hands the majority of the time. If your opponent is betting into you on the river in this spot. If our opponent is betting into us, once again we have to make the decision about whether or not we should call based upon the information we have gathered from previous betting rounds. You may also need to factor in the odds that your opponent is giving you to call, because if your opponent makes a very small bet, you may well be given the correct odds to call because of the likelihood that your hand will sometimes win. But at the end of the day, there are no concrete rules for these situations and it is just a part of poker that will take time, patience and a thorough understanding of the game to master. Playing the river out of position. It is nice to feel that you have the best hand, but unfortunately we do not have position to help maximize our winnings in these situations. If you feel that your opponent has a half decent hand, you should look to make a decent bet and hope that they will call, as it is not likely that they will bet if they are unsure about whether they have the best hand. If you think that your opponent missed a draw and has a very weak hand, it may be more profitable to check in an attempt to induce a bluff. If you bet and it turns out they have no hand at all, then you are not going to win any more money because they are just going to fold. If you check however, you are giving them the opportunity to make a bluff and squeeze out that little extra money from them at the end. It's pretty unfortunate to have the worst hand and be out of position, but its not all that bad. At least in these situations you will have a clear idea about what to do… check and fold to any action. It is rarely a good idea to try and bluff when out of position in these spots, so save your money for another time. Only bet if you are incredibly sure that you can get your opponent off the hand, otherwise betting out here is not going to be profitable at all. Although this might seem like a bit of a dilemma, its not as bad you think. The last thing you want to do here is bet out… its one of the biggest mistakes you can make in poker when you think about it logically. When you bet out not knowing if you have the best hand or not, you are only going to get calls from hands that beat you, and you are not going to get calls from hands that you are beating. It is a completely lose-lose situation, so never bet out if you are unsure about whether you hold the best hand or not. Never bet out when first to act on the river if you have a hand that could easily be either the best or worst hand. The only hard part in these spots is when your opponent comes back at you with a bet. In these situations you have to once again consider the way the hand has been played out up to that point, as well as think about they way your opponent has been playing in other hands as well as this one. If you think you have a decent chance of winning because your opponent is loose and bluffs frequently, then you have a good reason to call. However if you are not confident that you are ahead, you should be looking to fold unless you are being given good enough pot odds to make the call to see if you are ahead. It's all about practice and a good knowledge of your opponent's playing style. 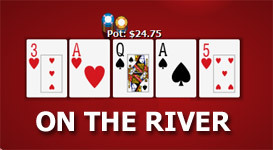 Don't bet on the river if you are unsure about whether or not you have the best hand. I know I have mentioned it before, but it is something that you should always remember. You are only going to get a call from a better hand and a fold from a worse hand, so don't make that bet! Always think about each play that led up to this point into the hand, and use it to influence the decisions that you make on the river. There is no better tell than the way an opponent has played their hand and the information they have given you by the way they have checked, bet or raised. Always bet around the size of the pot when you want a call when you hold the best hand. Even though you may well get called less often than if you made small bets, you will be winning more in the long run. Its more profitable to win $50 1 in 10 times than it is to win $5 8 out of 10 times. It's all about maximizing value from your hands over the long run. Go back to the thorough hand guide.